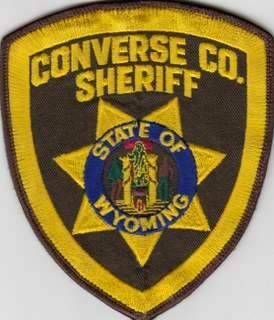 A man died early Thursday in a shooting involving a Converse County deputy, the sheriff there said, the third fatal law-enforcement shooting in Wyoming in the past two weeks. In a short news release, Sheriff Clint Becker said the deputy wasn't hurt and has been placed on paid administrative leave, a common procedure after police shootings. The press release did not say where the shooting took place or offer any details about the circumstances. It happened at 12:23 a.m. When reached by phone, Becker declined to release any information beyond what was included in the press release. An official with the Wyoming Division of Criminal Investigation, which is investigating the shooting, confirmed the deputy fired his gun during the incident. Kebin Haller, deputy director of operations at DCI, did not offer a more detailed description of the shooting. Haller did not say whether the man was armed. Neither DCI nor the sheriff’s office released the man's name. He is described as a middle-aged white man. Haller said the shooting happened off of a county road in rural Converse County. He said the man was not from the area but did not say where he was from. DCI is investigating the area of the shooting as a “death scene,” Haller said. Agents were there Thursday afternoon collecting evidence. The Converse County Coroner’s Office is also involved in the investigation. Haller said an autopsy, as well as a toxicology screen, will be performed on the victim. He did not say when that would take place. DCI will provide its final report on the investigation to the Converse County Attorney’s Office, which will decide if the deputy should be prosecuted for the shooting. The shooting is the third involving law enforcement officers in Wyoming in less than two weeks. Casper police shot and killed 27-year-old Christopher Benton on July 12 while serving a search warrant at his home. Police say Benton was armed with a gun and presented "lethal force" toward officers when they entered his home. A 23-year-old man died July 16 in Cheyenne after exchanging gunfire with police officers. Police were called to Saige Hack’s home for a domestic situation. Authorities say Hack opened the door and shot at arriving officers with a pistol. Police returned fire. The top 10 most-read stories on Trib.com for the week of July 20-26.